In this IBM® Redbooks® publication we demonstrate that it is possible to combine the traditional strengths of the mainframe to manage large volumes of data and run business transactions with the Web 2.0 paradigm. We can get simpler interfaces, better integration among different services, lightweight protocols for communication, and much more, together with the availability, security, and reliability of mainframe data. And we will show how mainframe data can be accessed by smartphones such as Android or iPhone. But we can do more to demonstrate how flexible the mainframe platform is. 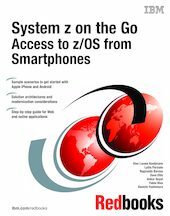 Through the use of pervasive devices it is possible to add new possibilities to mainframe applications, extending System z® capabilities. We can receive notifications in real time, for example, of successful or unsuccessful termination of a TWS job stream, or we can immediately get alerts about abends that occurred in a critical application. This book is another demonstration that the mainframe is alive and kicking and can and should play a key role in modern application architectures. Appendix A. Test drive yourself!